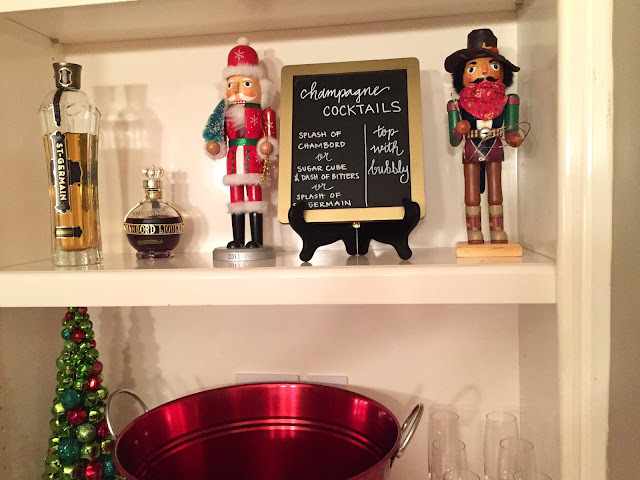 I love hosting in December! 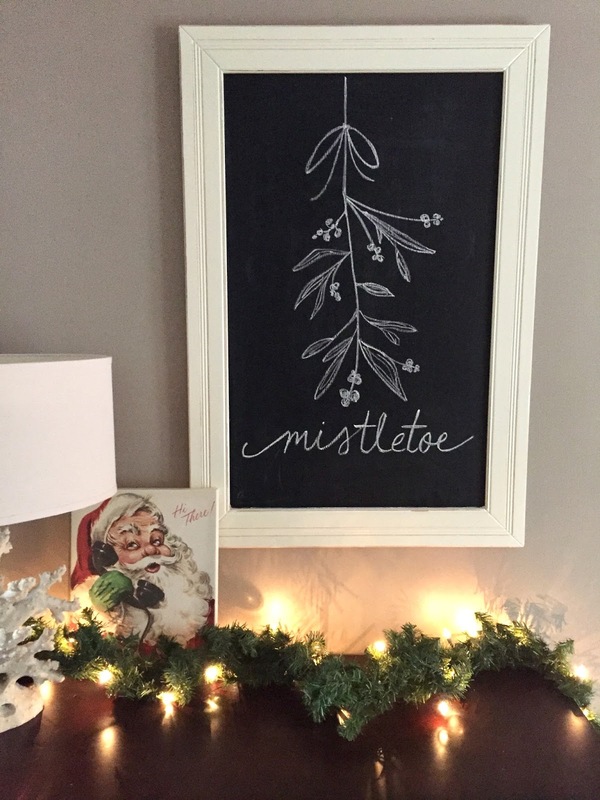 Since our house is always decked out for Christmas, the parties are extra festive (and extra easy as there is no need for more decorations!). Max and I came up with a genius idea for our hosting this year: we had two different parties to host - one for his division at work, and one for my Bunco group (I always leap at the hosting calendar for Bunco when it comes out so I can secure December!). Our genius idea? 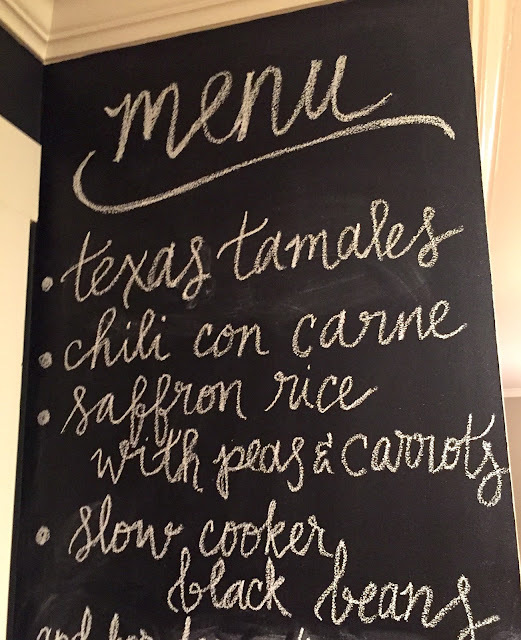 To host the parties two days apart, with the same exact menu. We had around twenty people on each respective guest list (ladies only for Bunco), so that helped in that we needed similar amounts of everything. Hosting them back-to-back was great since we just stayed in party hosting mode, and the best part was serving the same foods twice. We didn't have any cross-over in guests, so all of this worked (I even wore the same dress for both parties!). My favorite part about our parties this year? The champagne bar! In addition to red and white wines, I put out an ice bucket of champagne along with three different champagne cocktail recipes. It was a hit! We went through seven bottles of champagne at Bunco alone! We have tons of identical and inexpensive wine and champagne glasses for this exact purpose, so wine charms are a must to let guests identify their beverages. These gold numbered ones are darling and these gemstone ones would make a fabulous gift! I love cranberries at Christmastime, and since we have a ginormous rosemary bush, I combined the two for a festive drink garnish. 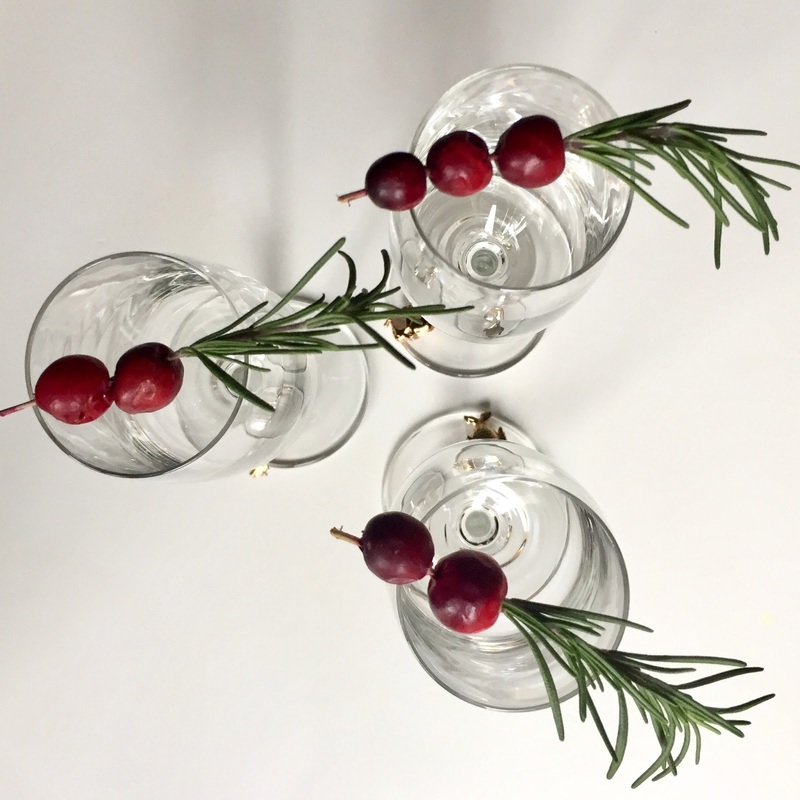 To make, just spear several cranberries with a toothpick to create holes, and thread a sprig of rosemary through (remove the rosemary from the stem on the part that will do the threading). On a side note - rosemary is super easy to grow. It also seems to thrive in any environment (even the Scottsdale desert). I planted our Alabama rosemary with my Mom in the spring of 2015 and it's still going strong, and has gone from a teeny tiny starter to a huge bush. It does seem to go a bit dormant in the dead of winter (it snows here in Huntsville) but springs back after. Our menu was a mix of purchased and homemade dishes, all of which could be prepared ahead of time (so nice when you're feeding twenty-ish people). 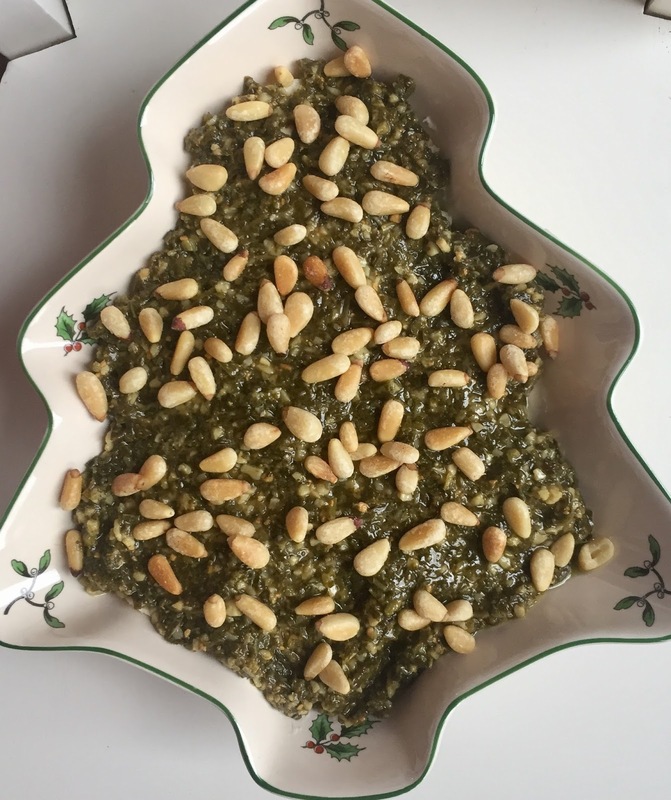 When it came time for dinner, everything was being warmed on the stove, in a crockpot or in a roaster, and guests just served themselves buffet-style. I read somewhere that real silverware makes eating so much more pleasurable versus eating with plastic. It makes sense - we wanted something that would hold up to the tamales, ha! I always bring out our beautiful engraved silverplate flatware (gifted from Parker's Gigi), and it makes everything seem even more festive. Bonus, it's dishwasher safe so we just toss them all in when the party is over. 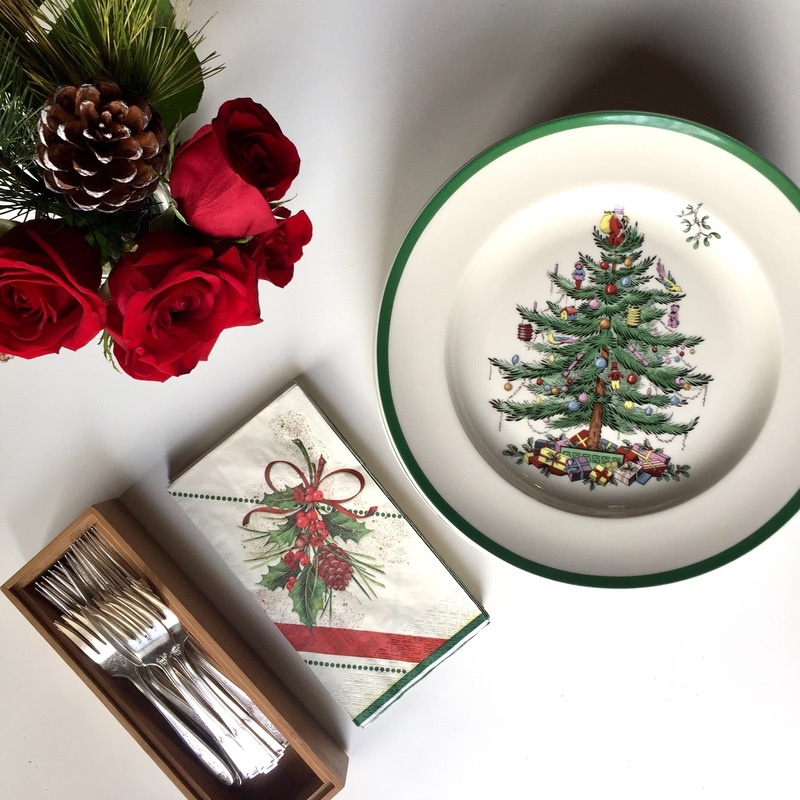 For dishes, Parker's Nana gifted us the gorgeous Spode Christmas Tree dinnerware. I feel the same way about the plates - they are too pretty to not use, and just like the silverplate, they go straight into the dishwasher post-party. It's actually so perfectly loaded at the end of the night since everything matches! I did purchase some extra matching dinner plates this year since we were hosting up to twenty. 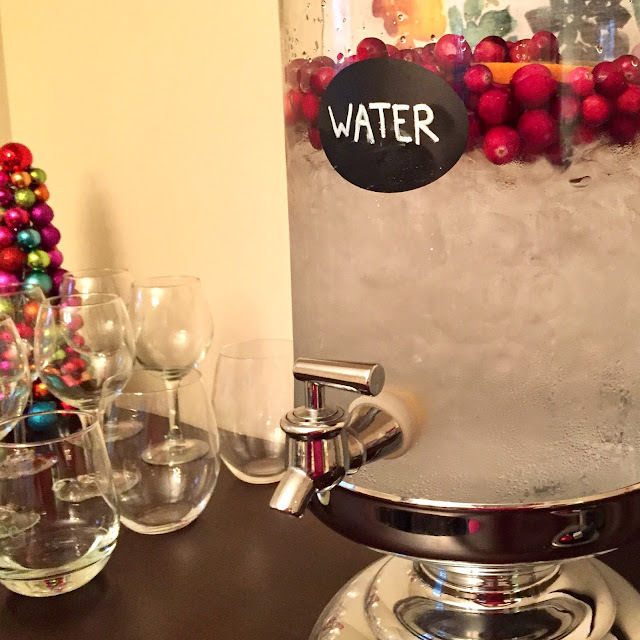 We felt it was a good investment since we'll definitely be hosting lots more holiday dinners over the years. 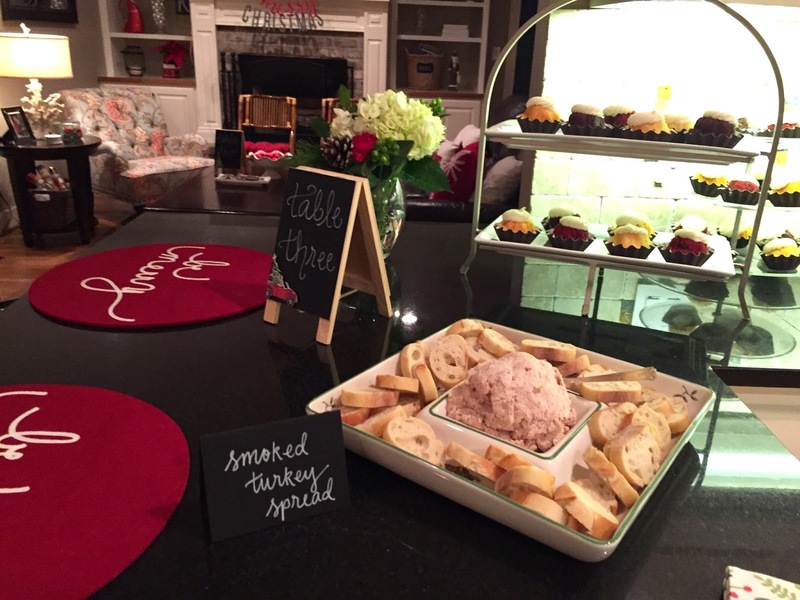 For the appetizers, simple and make-ahead was key. 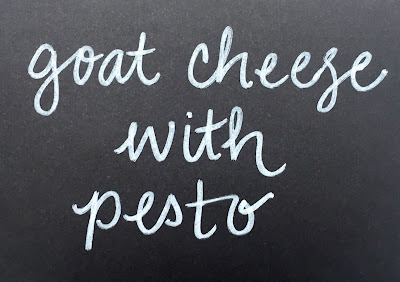 This goat cheese with pesto was gobbled up both nights. To make, just spread some herbed goat cheese into a bowl, top with jarred pesto and sprinkle on some toasted pine nuts. 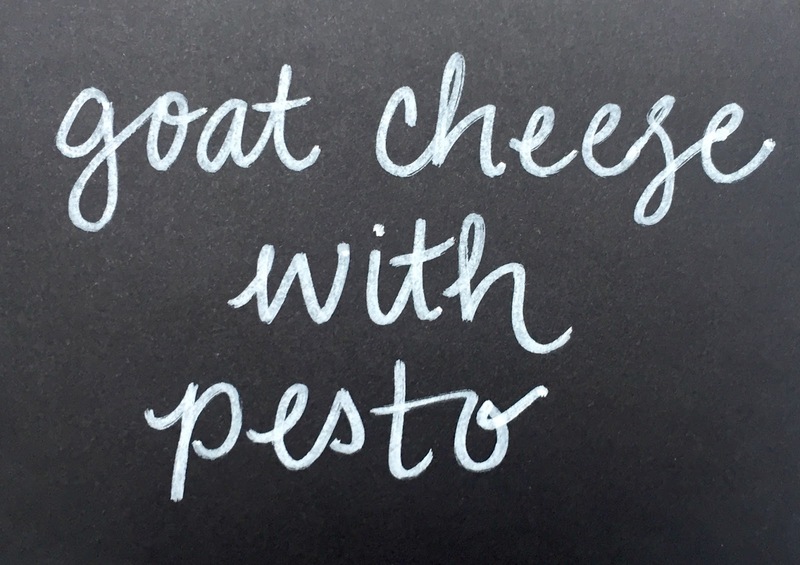 For appetizer labels, I used a chalkboard pen on black paper to mimic a blackboard (because I'm a bit chalkboard obsessed). The Bunco party was first, and proved to be a bit more rowdy as it was a bunch of ladies, and we had the late night rounds of Bunco to boot! 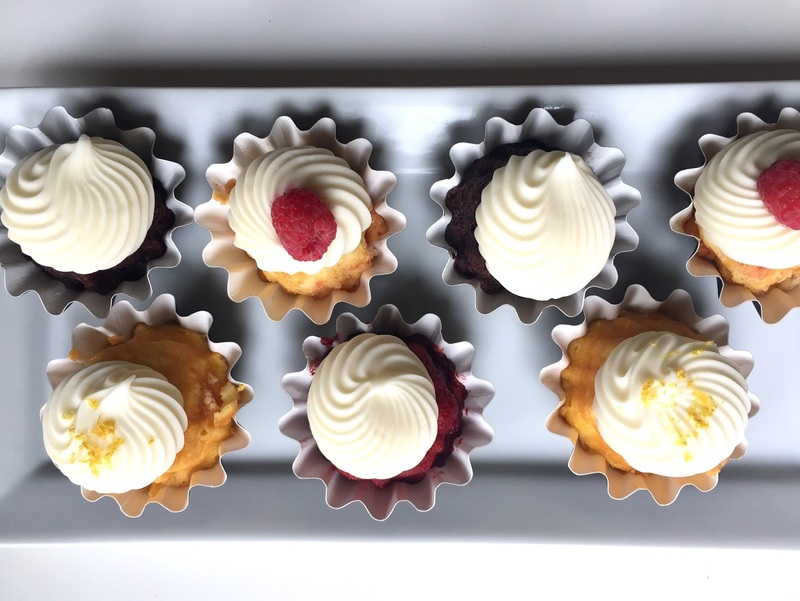 I did come away with a few ideas and pointers for Max's work party - for example, the Buntinis I served at the Bunco dinner weren't labeled with the flavors. 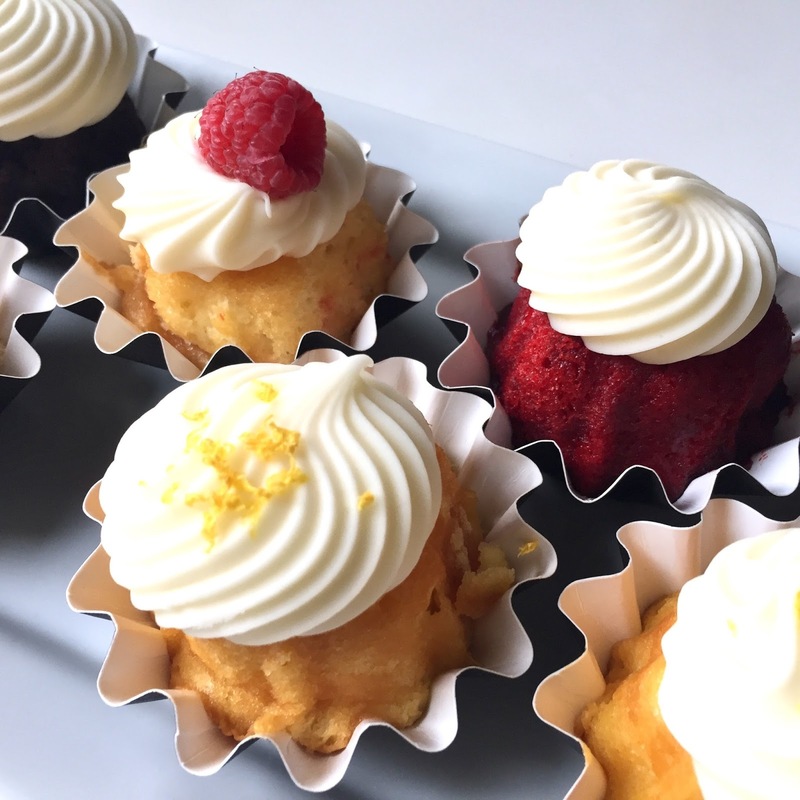 One of the Bunco gals suggested topping the raspberry vanilla ones with raspberries, and the lemon ones with lemon zest, which I did for the second party. I think it made them look even more adorable! I ended up doing all the flowers myself. Costco has such a beautiful selection and the best prices in town. 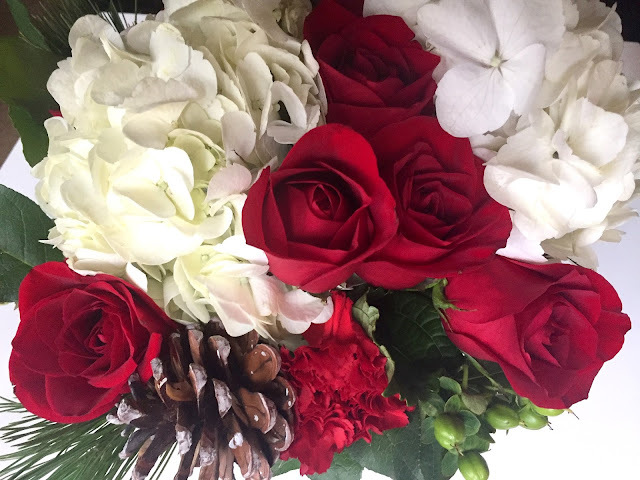 I purchased one holiday greenery bunch, one bunch of red roses and one of white hydrangea, which was enough for several displays. I just love the red rose/white hydrangea combo! Holiday festive makes me happy! Are you doing any holiday hosting this year? Chesson you are so sweet! And I'm now a convert and fan of the repeat-party! Though it only works if all the guest are different, ha! Love!! I inherited my mom's Spode dishes and I LOVE using them! We are hosting Christmas Eve this year for Greg's side of the family and I can't wait to pull them out!! Thank you!! Champagne cocktails are my fave, but it was my first time serving them... I can now say I'm a pro at popping bottles, ha! I love all this food and beautiful decor. 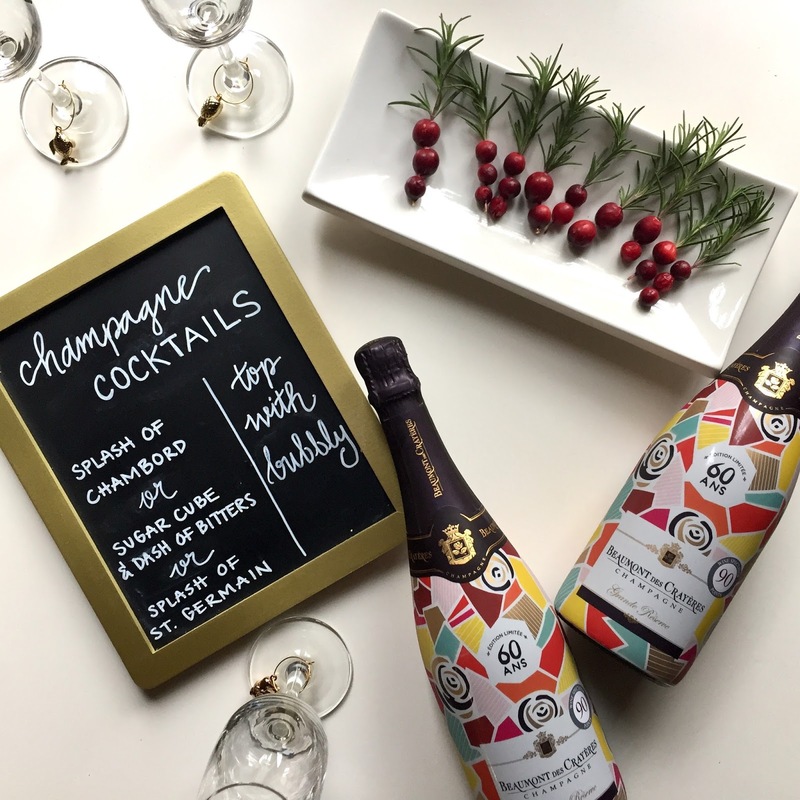 You did an amazing job and I love holiday cocktails with champagne! Thank you!! We seriously went through our stash of champagne for BOTH parties the first night, ha! Then we stocked up massively for party #2 (the work party) which went through way less... long story short, we now have a fridge full of champs.